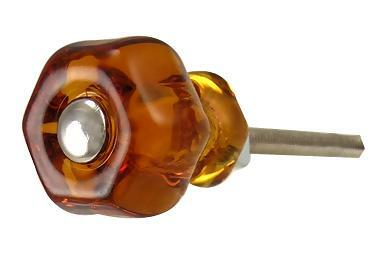 1 Inch Amber Glass Cabinet Knob- Glass specialty drawer knobs for end tables, specialty drawer knobs, small furniture drawers, medicine cabinets and restoration of vintage furniture. These glass cabinet door hardware measure nominally 1 inch (25 mm) in diameter (measured point to point on the hexagonal at the widest point) and they have a projection of 1 inch (25 mm). Sold individually with the removable Chrome 2 1/2 inch (64 mm) hardware. Brass hardware available.